At the end of July, I had a routine doctor’s visit. Got on the scale. Clocked in at 170 lb. I hadn’t weighed that much since 1991. So I got back on my bike. After that I got the hang of it, and bikes became an important part of my life. I started going on long-distance rides when I was 13. I did a little bike touring in high school, and I competed in some triathlons and bike races starting right after I graduated high school. I didn’t have a bike during the time I lived in Japan, and when I was living in Chicago for a couple of years after that, I had my road bike but didn’t use it much (thus the 170 lb). After I moved back to Austin in 1992, I got back into riding, and it was a great time to be a road cyclist in Austin—there were a bunch of then-pointless and unused roads that were like a playground for cyclists—360, Southwest Parkway, Bee Cave, and so on. I hardened up and could motor all day. On one occasion, I rode the 165 miles to a friend’s place in Houston in 9 hours flat. Some months later, I did it again, 20 minutes faster. In 2000, a lot of stuff in my life changed, and I found myself cycling less and less, but in 2010, I started riding regularly again as I prepared for my Southern Tier ride, which I completed in October that year. But that wrecked me—my upper body was emaciated when I finished. I remember at the end of the ride struggling to lift my 30-lb bike over my head. I decided I needed some kind of a whole-body workout. I signed up for a bootcamp class, and stuck with it until it petered out several years later. I never found a replacement that interested me, so I was back to a relatively inactive lifestyle (thus the 170 lb). As of today, I’ve logged 900 miles since that doctor’s visit. I’ve clawed back a fair amount of lost fitness, and lost the weight I wanted to lose. But I’ve got a long way to go before I’ve got the level of fitness I had when I was younger—if in fact it’s possible to attain that again. It would have been better all around if I had stayed more active. Four years ago today, I was smack in the middle an adventure: a transcontinental bike ride. When I finished that ride, my body was wasted: I had lost at least 15 pounds. You could see my ribs through my back. I decided it was time to find a more whole-body workout. I started doing a boot-camp workout with Gwen. I wouldn’t say that I enjoyed it, exactly, but it was definitely good for me. After a few months, I had finally resolved some weak spots left over from my broken pelvis, and had built up core strength that I’d really never had before. I was pretty regular about it for the next 3½ years or so, going three times a week, occasionally taking a month off when life got crazy. Boot camp completely displaced cycling for me. I didn’t do any serious riding after I got home from my big ride, only commuting around town. A couple of months ago, that boot camp class ceased to exist as such when the trainer started a gym; he offers something similar at the gym, but I realized I don’t want to go to a gym. I was also missing riding. Today I went out with a friend for my first ride in four years. My neck’s a little stiff, and I was tired earlier than I should be, but it was good to get out there. I still need to do some kind of whole-body workout. But I need to keep riding my bike. I recently resolved a nagging issue in my life that had been like an albatross around my neck for years. Back in ’97, I visited the Netherlands, and became interested in recumbent trikes. I’ve always been drawn to the mechanically obscure, and if recumbent bikes are weird, recumbent trikes are way out there. As is my wont, I researched them obsessively when I got back home, and eventually homed in on a model that, even by the rarefied standards of recumbent trikes, was exotic. It was the AS Engineering Zenit. Made in Russia by former Illyushin Aircraft engineers, it had front-wheel drive, a box-section aluminum frame, hydraulic drum brakes, and other unusual features. I ordered one. It took forever to arrive—the better part of a year. I may have been the last customer to have an order filled. I know that AS Engineering stiffed several customers. It didn’t come as a finished product, but it didn’t come as just a frame (the way many custom bikes do) either: because of its many custom parts, it was somewhere in between. I began putting it together with quality parts, but after a while, I got bogged down. I had routed the hydraulic lines poorly, and didn’t want to redo them. One of the lines also needed to be re-bled, which was a massive pain. The shifting was erratic, and I had trouble getting that dialed in. So it sat in the shed. For a decade. Every time I went into the shed, there it was, mocking me. Eventually Gwen gave me the ultimatum “ride it or get rid of it.” and I eventually decided to get with the program. I took it to Austin’s recumbent bike store, and had the proprietor deal with its various shortcomings. At the same time, I found a website for recumbents that included a classified section. Someone saw it listed and told a friend, who had been looking for a Zenit for years. I sold it. Putting that trike behind me was an illuminating life-lesson. I had let a molehill grow to a mountain in my mind: I had become frustrated by some minor problems and intimidated by the prospect of fixing them. Ironically, in the ten or so years that had passed, those problems became much more difficult to solve (the hydraulic parts needed for the trike had become much harder to obtain, and there was a new leak somewhere). But revisiting the trike reminded me of an idea I had for it when I first got it: to use it as the vehicle for a transcontinental bike ride. I had completely forgotten about that goal after the tumult of breaking my pelvis, getting divorced, and getting into firedancing in 1999–2000. But reminded of it, I realized that I still wanted to do it. I mentioned it to Gwen and she said “You’re not getting any younger!” So that’s going to be my big project in 2010. Ironically, I still think that a recumbent trike is the right vehicle, but I have no regrets about having sold the Zenit, and would shy away from using it for this purpose if I hadn’t: a trike with critical parts that simply cannot be replaced if they break is a bad vehicle for a 3,000 mile journey. 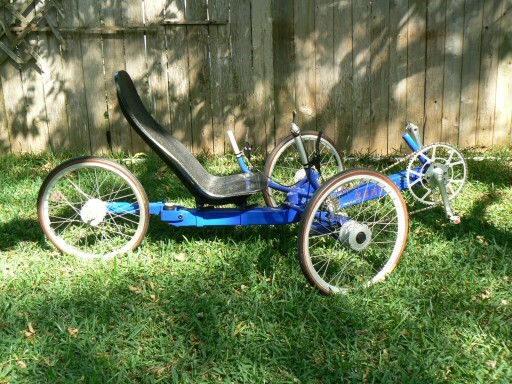 And at this point it would be bad mojo to ride a trike that symbolized my own inability to complete a project.